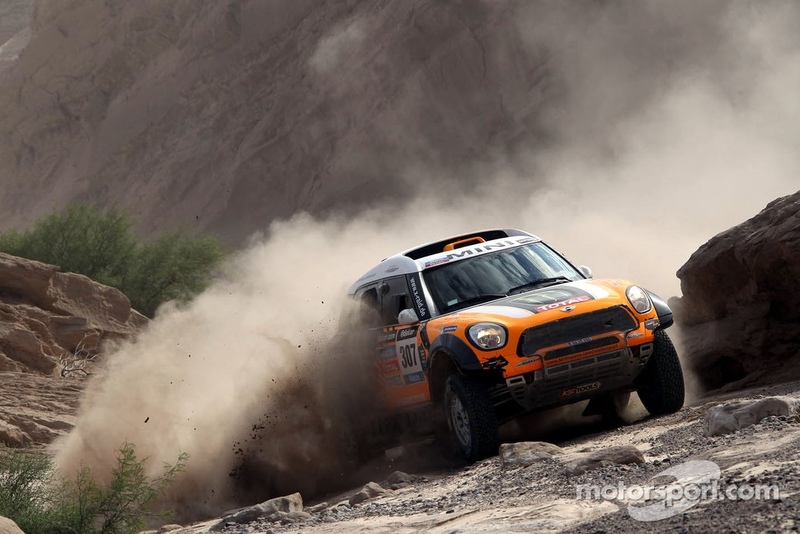 In the sixth stage of the 2014 Dakar Rally, from Tucuman to Salta, Stéphane Peterhansel (FRA) and Jean-Paul Cottret (FRA) proved to be the quickest, with their black MINI ALL4 Racing, thus celebrating their second stage win. Second place was secured by Argentinean Orlando Terranova and his Portuguese co-driver Paulo Fiúza in the orange MINI ALL4 Racing. Meanwhile, the winners of yesterday’s stage, Nani Roma (ESP) and Michel Périn, crossed the finish line with their yellow MINI ALL4 Racing in sixth position. The pole Krzysztof Holowczyc and his russian co-pilot Konstantin Zhiltsov finished the sixth stage in their red MINI ALL4 Racing on the [in] 8th place. Saturday was a day of rest for the teams. There was no racing. BestOfRallyLive.com, the day’s top 10 featured seven MINIs. Roma/Périn (Mini/Michelin), 27h3m52s. 2, Peterhansel/Cottret (Mini/Michelin), +31m31s. 3, De Villiers/Von Zitzewitz (Toyota/Michelin), +48m23s. 4, Terranova/Fiuza (Mini/Michelin), +54m34s. 5, Al-Attiyah/Cruz (Mini/Michelin), +1h18m3s.